Keeping tabs on how much data your Android device is chewing through is vitally important if you don't want to get hit by a surprisingly large mobile bill at the end of the month. If you head off to foreign shores, then knowing how much data you're getting through becomes even more important. Below we'll show you how to track your data usage on Android. Does Android use more data than iPhone? Fortunately, the latest editions of Android come with integrated data monitoring tools that keep track of these statistics; and, if you don't find the integrated features comprehensive enough, there are several third-party apps available through the Play Store that you can turn to instead. Tap the Data usage entry in the Settings menu to get a breakdown of how much data your device has been using. The top two options let you switch mobile data on or off, and set a warning limit — the graph below shows data usage. The chart shows usage over the course of a month. If your mobile operator bills you monthly, for example, then you can tap the date range to set when the usage graph resets — this lets you stay in line with your monthly data allowance. Once you set a limit, you can slide the bars on the graph to determine when you get a warning (the black bar) and when mobile data gets shut off altogether (the red bar). Remember that the data usage monitored by your operator may not exactly match the figures reported by your device, so be conservative with your limits. Underneath the chart is a list of the worst offenders when it comes to using data over cellular networks. 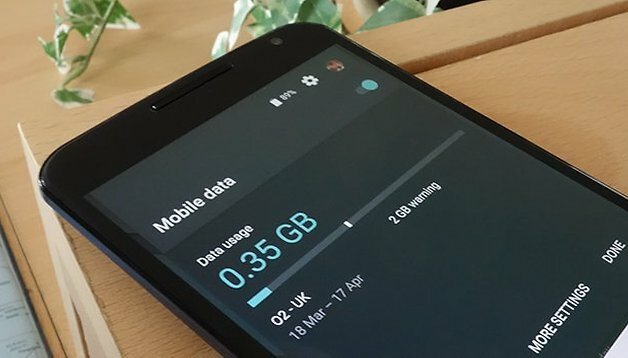 To get a quick glance at how much data you're using in Lollipop, drag down the notification drawer and tap on the network operator name — the slider that appears will show your current monthly usage and the warning levels you've set up, if any. Tap More settings to go to the main Data usage screen. As well as switching mobile data off completely (either manually or when the configured limit is reached), you can tackle data usage on an app-by-app basis. Tap on any of the apps to see how much data has been used by that app alone over the specified timeframe. Toggle the switch marked Restrict app background data and the app in question will no longer be able to get online without a Wi-Fi signal (so no mobile data is used). It's a handy way of blocking particular data hoggers. If you want to switch off background data usage across the board, tap the More menu on the main Data usage screen (three vertical dots), and choose Restrict background data from the list. Bear in mind that certain apps may have data usage settings of their own. If you use Dropbox, for example, there's an option in the settings to only upload photos and videos when you're attached to a Wi-Fi network. If you notice particular apps using up a lot of data, try tweaking their in-app settings. As always on Android, there's plenty of third-party app help if you need it. One of the best is Onavo Count, which can give you a host of helpful insights into how you're using data on your mobile, even letting you compare your usage stats against other Android users. Elsewhere there's My Data Manager, offering a set of tools for managing data usage across your family (so you can quickly tell whether the kids are spending all their time on Netflix or not). You can split data usage by app and there's a feature for specifically tracking data roaming abroad too. Data Monitor is another impressive app in this area. Its interface is packed with more charts and statistics than you're ever going to need — you can even get a permanent, on-screen widget showing how much data your device is currently getting through. It's accurate, simple and well worth a look. With the tools integrated into Android and the extra apps available from the Play Store, you should have more than you need to stay on top of your data usage — now there's no excuse for racking up a huge phone bill. Have you tried to track data usage on your Android device? Let us know. update via downloading the file.